My Saturday went by quickly. Besides a huge outburst from son screaming and yelling at me and at some point getting physical, nothing much actually happened. I didn't bake, I didn't go out or even bring my girl for her taekwondo class! I just stay home to rot. hahhaa... actually I stayed home to spend quality time with my girl! and waiting for son to be home by 11:30pm! There are moments, he thinks he is a big man but unfortunately, he is only 14! So please don’t tell me that this little man here can have NO curfews. Sunday was a good day. I got tickets from a good friend, LT to watch Courageous, a moving movie about dads and their views about parenthood. Actually we were supposedly to watch it with hubby. It will be really great if my hubby is around but plans always stay fickle when he is concerned. Ever since, he took on this role, he has been flying around 80% of his time. I am trying to cope with it but with a special teens on hand, it makes life extremely tough. 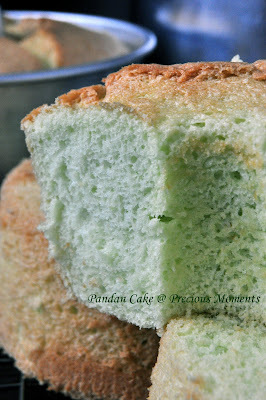 On a happier note, I don't know when my girl fell in love with Pandan cake , I don't bake that at home because this mommy here, doesn't like the taste of coconut in cakes. Somehow, this little one tasted it somewhere and had since been asking for it whenever we see it bakeries. I decided to bake her one. After all, my helper opened up a big box of coconut milk, use a little and left the remaining sitting in the fridge waiting to get thrown out. (she always does that .... arrggh ... so wasteful). It was a big cake, thus I actually separated it into different baking tins. My helpers and my girl both like it very much but personally I find it a little sweet (despite cutting down 50g). There isn't any coconut taste to it as compared to the standard. Thus for people who like my hubby loves lemak, this chiffon is definitely not for him. For me, I am fine with the taste. Texture wise, it is extremely cottony. If you aren't a very coconuty person like me, this pandan cake will be the one. Preheat oven to 165 ºC . Prepare ungreased 9” chiffon pan. 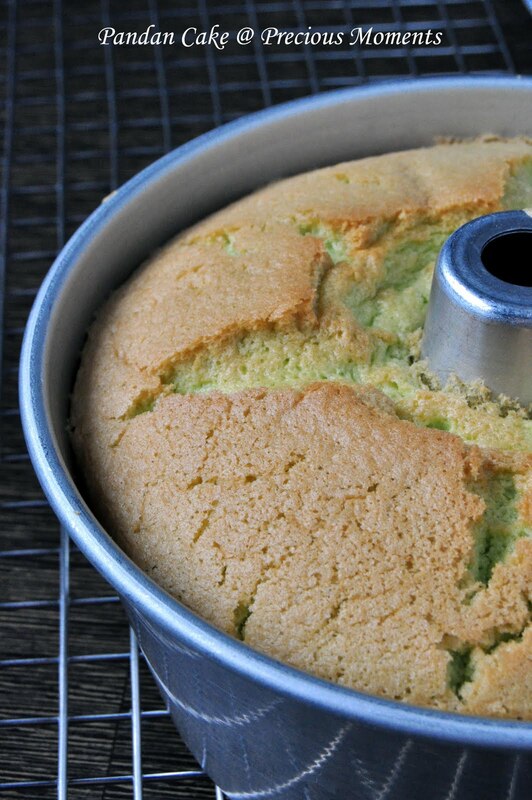 Mix pandan juice, coconut milk, egg yolks and vegetable oil and whisk until smooth. Set aside. Sift cake flour and baking powder. Add 3 tbsp of sugar and salt and whisk well to blend. Add egg yolk mixture and whisk until smooth. Beat egg white and cream of tartar on high till soft peaks. Add in 3 tbsp sugar and beat till stiff peaks. Fold egg whites into batter in three additions. 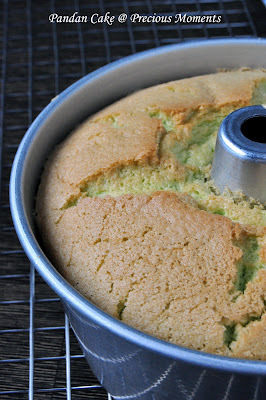 Pour batter into pan and bake for 55 – 60 mins. Invert cake onto rack once cooked. Leave to cool completely before cutting. The cake looks quite soft! I really should get myself some pandan leaves! Wow, the recipe seems huge. 300gm of sugar is indeed a bit too much for that amount of flour and eggs. But then again, I think your helper will find it just nice. They have sweeter tastebuds, right? Actually if your helper is using coconut milk to cook savoury food, freeze the coconut milk in ice cube trays. Take as needed. For savoury foods, frozen ones are fine. Just not for sweet food.